The Ssangyong Korando is aimed squarely at the towing market. Turn up for a test drive at your local Ssangyong dealer and you’ll find every demonstrator is fitted with a tow ball. On paper it has the makings of an impressive tow car. The kerbweight is higher than most rivals’, making the Korando a sensible match for heavier vans, and the 173bhp 2.0-litre engine is impressively powerful. The two-tonne legal towing limit is reassuring, too. The Korando has numb steering but good grip and tidy handling with a caravan in tow. In reality, there are a few rough edges here and there, but for the money the Korando makes an impressive tug. We hitched up to a caravan with a Mass in Running Order of 1292kg and towed on the road and at the test track. Accelerating from 30-60mph, as you might when joining the motorway, took 12.1 seconds. It’s a shame the engine makes such a racket, though. Even at a steady speed you can hear the diesel grumbling away. The handbrake needed a firm pull before it would hold the outfit still on a 1-in-10 slope, but otherwise the Korando tackled hill starts well, in first gear and in reverse. And we have no complaints about the brakes, which stopped car and caravan in 10.5 metres from 30mph. At high speeds the Ssangyong Korando 2.0 Diesel Auto EX is steady and stable. Despite uncommunicative steering, it made a decent fist of the emergency lane-change test, too, holding its line without letting the caravan drag the car off course. Practicality is one of the Ssangyong’s big strengths. There’s much more room inside than in many rivals, especially for those travelling in the rear seats – and luggage space is generous, too. Pricing is very keen. You’d struggle to find another 4x4 so well equipped for similar money. 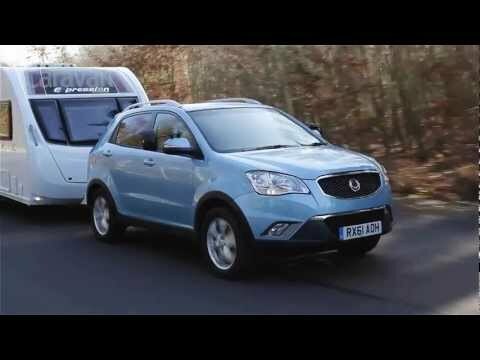 Overall, Practical Caravan's expert review team considered the Ssangyong Korando 2.0 Diesel to be a stable, practical tow car at a very keen price.